Panama’s David Dimas Chock emerged as the name to attract the attention as matters progressed to the quarter-final stage of the Junior Boys’ Singles event at the 2017 El Salvador Junior and Cadet Open on Saturday 19th August. A first round success against Mexico’s Layan Neumann (11-8, 11-9, 11-9, 11-9), he accounted for the host nation’s Oliver Mendoza, the no.4 seed, in a hard fought full distance seven games duel (8-11, 11-6, 6-11, 11-6, 2-11, 11-8, 11-8) to reserve his place in the round of the last eight names. Defeat for Oliver Mendoza; there was a close call colleague Oscar Villalta, the no.5 seed; he needed the full seven games to overcame Sweden’s Oskar Hedlund (11-9, 2-11, 9-11, 10-12, 13-11, 11-9, 11-9). Eventual success for Oscar Villalta; for the remaining leading names, life was much less exacting. Sweden’s Oskar Danielsson, the top seed, accounted for El Salvador’s Jaime Galeano (11-6, 11-6, 11-6, 11-8); Jacobo Vahnish, like David Dimas Chock from Panama and the no.3 seed, overcame Oskar Danielsson’s compatriot, Teodor Siljeholm. Similarly, India’s Mudit Dani, the no.2 seed, beat Mexico’s Adrian Castillo (11-3, 11-4, 11-8, 9-11, 11-7). 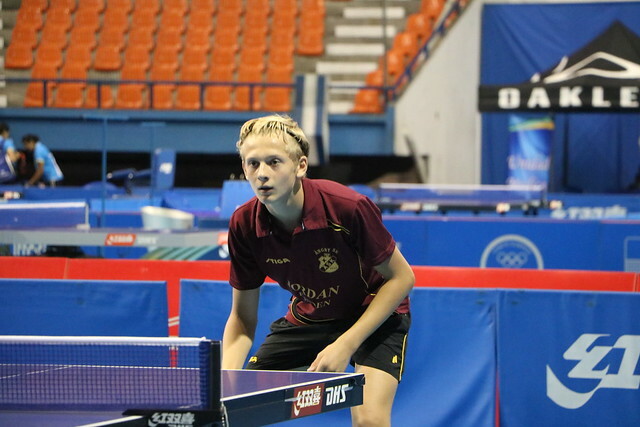 Success for four of the five players on duty in the Junior Boys’ Singles event who possess world rankings, in the remaining three contests it was success for Puerto Rico. Daniel Hernandez beat Costa Rica’s Victor Urena (11-7, 11-5, 10-12, 11-2, 9-11, 11-5); Angel Naranjo accounted for El Salvador’s Diego Castellanos (11-5, 11-7, 11-9, 11-8), whilst Jabdiel Torres ended the hopes of Guatemala’s Sergio Carrillo (11-6, 12-10, 11-9, 10-12, 11-8). At the quarter-final stage Oskar Danielsson meets Daniel Hernandez, Angel Naranjo opposes David Dimas Chock. In the lower half of the draw Jacobo Vahnish confronts Jabdiel Torres, Oscar Villalta plays Mudit Dani.